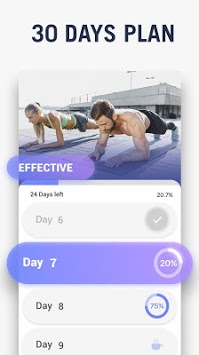 This app provides different plank variations to help you lose weight, gain strength and get a stronger core. The mixing of static and dynamic planks really helps you burn fat fast. Take only 7 minutes a day to burn calories and get in better shape! With 3 difficulty levels, the 30-day weight loss plan perfectly fits all fitness levels, and it suits both men and women. You can customize your training plan according to your own preferences. There's no equipment or gym needed; you can do plank workouts anywhere at anytime. Planks are the most popular and effective fat burning exercise. They can be easily performed and activate all your muscles, including your core, shoulders, glutes, etc. Planks are the best choice for people with weak knees because they put no pressure on knees. Maximize the belly fat burning: Planks are more effective than crunches at burning belly fat. Planks activate 100% of your abs, while crunches only involve 64% of them. Strengthen your core: Plank workout fires up all your core muscle groups, enhances your core strength, and helps you get a strong core. Reduce back pain: Plank workout can strengthen your back muscles, reduce back pain and lower the risk of back and spinal column injuries. Improve your posture & balance: Plank workout requires your head, back and feet to be in a straight line. Regularly doing this will improve your balance and posture when sitting and standing. Accelerate your metabolism: Doing planks keeps your metabolism high for the whole day; this dramatically boosts the fat burning process. 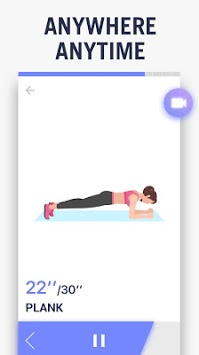 Improve your flexibility: Plank workout stretches all your posterior muscle groups, such as your shoulder blades, glutes and hamstrings, thus improving your flexibility and lowering the risk of injury.